Except for the green glow from the boat’s console, there wasn’t a light to be seen on Kerr Lake. No stars, no moon, no lights at all. Thankfully, we had set out lines while there still was a feint glow in the Virginia sky. Now, we sat around the deck of the 23-footer, quietly talking and waiting for something to happen. When the clicker on one of the big casting reels began to tick, Sean Lewis and I both jumped towards the rod while Glen Hughes reached for a powerful spotlight. When the clicker settled into a fast rhythm, I grabbed the bending rod, and Hughes’ light dispelled the darkness. 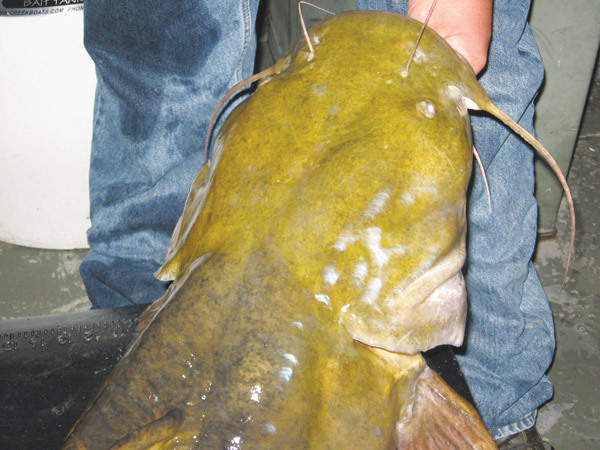 Flathead catfish run deep, hard and bullish. Size matters, and when one of these fish gets above 30 pounds, there’s no way to bring it in quickly. Strong runs are followed by strong rolls, and always the fish is plunging head-down. After an angler finally starts to lift a big flathead, it still continues to fight. Flatheads are tough to turn, tough to stop, and even tougher to guide to the net. When I finally managed to get this one near the boat, it decided it wasn’t quite ready and made another diving dash for deep water. All I could do was hold tight and hope nothing broke. This fish wouldn’t give up, and when Lewis maneuvered a net beneath it, it still fought for freedom. Nevertheless, we won, and after admiring the brutish creature of the deep lake, we released it. Catfishing is a bait-and-wait game. Big flatheads don’t come easily, and for the most part, they don’t come quickly. While plenty of flatheads are caught during the day, night is the prime time for the big bruisers. Flatheads feed heavily under the cover of darkness. They may spend the day in deep water, but as evening approaches, they move shallow. Lewis has fine-tuned his understanding of Kerr Lake’s big flatheads even further. Some of his favorite locations are logjams where high water has washed the fallen timber into massive piles of wood and debris. These jams typically form on the up-current side of islands and on tributary bends. For our first stop this night, Lewis motored up the Staunton River—no place to go at night unless you’re familiar with the flow. Even then, Lewis decided to make our upriver run while there still was light in the sky. As we left the ramp, heavy, rain-swollen clouds hung to the southwest. After reaching our destination, we anchored about 40 yards from an island jam, settling in perpendicular to the flow. All rods, six of them, were set on the starboard side of the boat. When the lines were out, we had covered the long, wooded weave from one end to the other. Logjams can be complicated structures. In front of the timbers there often are what Lewis called “wash pits.” Basically, wash pits are big divots scooped out by the current. When my weighted bait drifted into one of these pits and fell off the edge of the level bottom, I could feel the hole was about 4 to 6 feet deep. This particular jam was some 30 feet wide and some 60 feet across, situated against the head of the island. The flow swept both sides of the jam, with deeper, slower water on our right side looking downstream. The shallower, stronger current ran to the left. Lewis thought the size of this jam was working in our favor. Of course, fishing near such a dense tangle requires that an angler make a quick stop on a running fish—as quick a stop as possible, anyway. To give himself a chance, Lewis uses stout rods and strong terminal tackle. His boat carries a collection of 6-foot Shakespeare Sturdy Sticks and 7-foot 10-inch Bass Pro Cat Max rods. The Shakespeare’s are white, which makes them easy to see at night. However, the black Cat Max rods can better put a halt to the run of a big flathead, definitely an advantage around logjams. Lewis attaches a 50-pound-test shock leader to the end of the main line. The leader is only about a foot in length and connected with a barrel swivel rated to hold at 90 pounds. Above the swivel, he adds a large bead for protecting the knot. The running line is 30-pound-test P-Line. Lewis prefers high-vis chartreuse, because when the sun goes down, he can shine a black light and light up the green thread like a meteor streaking across the sky. Big catfish often telegraph their initial take with light jumps of the outstretched line. Even before the reel begins to click, an observant angler may see these quick flicks. In daylight, the motion is easy to spot. And the black light makes it just as visible at night. Before adding the bead and tying on the swivel, he threads on a flat-side weight of between 2 and 4 ounces; size depends on the speed of the current. While egg sinkers are commonly used by other cat anglers, Lewis prefers the flat weight because it doesn’t roll, and a more stationary weight helps prevent the line becoming entangled in the logjams. Same as an egg sinker, the running line is fed through a hole in the center of the weight. The hook tied to the end of the shock leader is a wide gap 8/0 Gamakatsu that looks like it could handle a shark, and when it comes to bait, Lewis definitely views the flathead as a meat-hungry predator. His choice offerings consist of bluegills, pumpkinseeds and shad, which he keeps alive in a large aerated tank in front of the boat’s center console. Lewis also mixes the size of the baits using large ’gills, smaller pumpkinseeds, and medium-size shad. About twenty minutes before dark, one of the lines jumped, the clicker sputtered, and the rod bent. I set the hook hard on a nice 5-pound channel catfish. Lewis commented that logjams are also excellent places for channels. We were prepared for a long night of fishing, but soon after the sun faded, the sky opened up with a pelting rain. We pulled in the baits and motored back to the ramp, soaking wet. Hughes said that because we had anchored before dark, he had decided to set up close to the rise, what he called a stairway the flatheads climb from deep to shallow water as the day ends. If we had anchored after it was fully dark, he said he might have gone back farther on the flat. We didn’t get a bite in the first hour of full darkness, so we moved and re-anchored. Now it was really dark—again no stars, no moon, no light at all except for the pale green glow from the boat’s console. This night was growing long when the bait on one of the rods “got nervous.” I could see the white rod tip twitching and the chartreuse line going from slack to tight and back to slack. Nothing else happened for a few minutes, and then the clicker started talking. I grabbed the rod, Hughes grabbed the light, and the fight was on. Ten minutes later, we were boating a fish over 30 pounds. An hour later, Lewis landed another. We didn’t weigh the fish before releasing them. But by consensus, we agreed that both were over 30 pounds. When I lifted them, I grunted. With the bright lantern light shining on their flanks, they appeared mostly dull olive, and their heads were the size and shape of big shovels.